stimulation, shaping, buffing, massage, callus treatment, and beautifully polished enamel. Hand treatments are waterless to prevent dry and brittle nails. 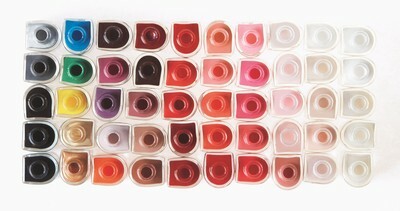 Cuticles are softened using a blend of vitamin E & jojoba oil to condition nails. Hands are massaged with a facial quality moisturizer, which helps to restore the elasticity of the skin. This essential pedi includes a warm foot soak in a mineral bath with all the basics of a pedicure. A hydrating lotion is then massaged into your skin before your choice of enamel. *scrubs & masks used in treatments subject to change w/o notice. On like polish. Wears like gel. Off in minutes. 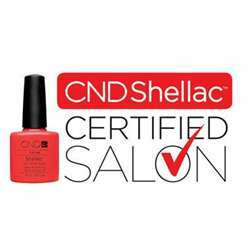 Shellac, from Creative Nail Design combines the ease of polish with the permanence of a gel. A chip - free, extended wear color with no dry time. Lasts for 14 days. To schedule an appointment, please call Corrin at 510.798.7737. Click on the following links to learn more about facials, or eyelash extensions. I have received facials, manicures and pedicures from Corrin at Le Visage. Corrin provides superb customer service and care. I travel over 40 miles to receive her service. I was impressed to see that Corrin does not reuse her emery boards for other clients and allows her clients to either take it home or she will save it for their next visit. Corrin also uses great products. In particular, Corrin uses Creative Nail Design (nail polish) which I have found to last longer than the usual nail salon products. If you choose to use Corrin's sevices, you will not be disappointed. I get my pedicures done by Corrin as frequently as I financially can. Corrin does an excellent job on my feet. I love the fact that she has created my own personal envelope with all the filing equipment just for me. She does not use the same on everyone. THAT IS A PLUS!!!! And the polish she use on my feet last for a long time......at the least two weeks. Corrin uses excellent products and she truly cares about how you look and feel. By the way, Corrin also do a very good job on waxing my eyebrows as well. I know I will look good every time. I truly trust Corrin with all the services she provides. Corrin introduced me to Shellac ten days ago and I love its wearability. The process takes a bit longer than a regular manicure, but well worth the time and money. Shellac holds up well to water, everyday chores using my hands and especially the brutal abuse given by my airplane job. Shellac has protected my nails from breaking, creeping and the need to refresh with a top coat every other day. I am wearing Negligee now and my nails still look so healthy and alive. I have confidence in the Creative line of products and in my fab nail tech, Corrin. Copyright 2009 Fine Hands. All rights reserved.